Tiwa Savage finally broke silence to respond to the series of allegations her estrange husband made against her following an intense outburst on Instagram that shook the entertainment industry. Following the rants and accusations made by Tiwa Savage's husband, Tunji 'Teebillz' Balogun about the singer's alleged sexcapades with female colleagues in the entertainment industry, she has come forward to deny the allegations. Speaking in a recent video interview with ThisDay's Azuka Ogujiuba, the 'Kele Kele' love singer, amongst other revelations said she has never cheated on at husband. "I have never cheated on my husband. Not with Don Jazzy, Dr Sid, 2face Idibia or anybody. I am willing to take a lie detector test. "I have never cheated on my husband, and Tunji knows this. He knows that in his heart. "This hurts. I have seen comments of what people are saying about me. It is not true," she said. 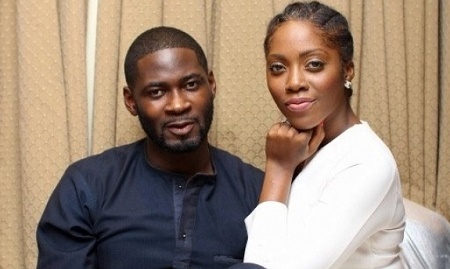 Tiwa however admitted that the marriage is over and she would at this time focus on raising her baby. She also said she would pray for her estranged husband to get well.